Mitt Romney endorsed much of President Obama’s foreign policy and therefore handed victory in last night debate to the incumbent. It was the least aggressive of the three debates. The answers given by both men were at times repetitive and predictable. Sometimes I felt a touch of the groundhog day and wished I had switched over to watch Homeland. Although last night’s debate was centred on US foreign policy both candidates veered regularly into domestic issues. You wanted the moderator, Bob Schieffer, to rein in the debaters and get them to answer the questions directly. But that’s politics. The debate touched on issues including Afghanistan (troop withdrawal), Israel (threat to) , Iran (nuclear arms), Libya, Egypt, Syria and China’s economic influence and “unfair” trade advantages. I was really surprised that the candidates were not given any questions on Palestine, democracy across the middle east, continuing European economic meltdown, illegal drugs trade, African investment or the Cuba. Given Romney obvious weakness on foreign policy it was a smart ploy by him to bring up the economy and play to the issue which has been his strength during the first two debates. Obama was commanding and forced Romney’s into confirming his endorsement on a number policies relating to Syria, Iran, use of drones. Quite simply Romney played it safe. I wish they had used Martha Raddatz as the moderator given her foreign affairs background as journalist over the past 20 decades. I felt Schieffer was weak and some of his questions were not strategic enough. Raddatz performance at the Vice Presidential debate warranted her inclusion last night. Now that the debates are over you wondered if they made much a change to the US voter’s intentions. The constant US campaigning had seemed a long drawn out affair. With the president campaigning so relentlessly over the months made me wonder how does he have time to run the country? The biggest disappointment for me in following the US elections so far had been the advertising spending of up to $1 billion US dollars in total by both campaigns. Given the current economic state of the US that kind of political spending is just sick. 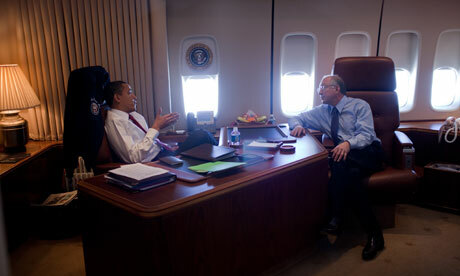 Has Obama done enough to keep his seat on Air Force One? This entry was posted in obama, politics, romney, US Elections and tagged obama, politics, Romney, us elections. Bookmark the permalink.